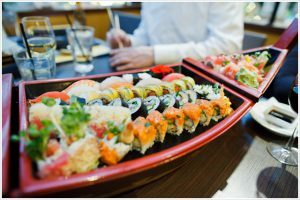 "I've been told that I'm probably the only person that goes to a sushi place but doesn't order sushi. I love LOVE any kind of noodles with a broth base. With that being said, the ramen noodles here are delicious!! My favorite place to go for ramen. My opinion is that Akebono out beats any of the restaurants in Sacramento that specializes only in Ramen. And for the price and portion, the only complaint you'll probably have is that you're too full! Besides the ramen dishes, the gesu is also a must for me every time I dine here. Squeeze the lemon on top and you're in for an adventure that will end with a smile. 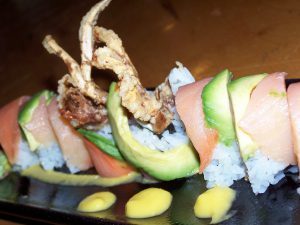 "This is my favorite Japanese restaurant in Sac. It's one of the few that's actually authentic (most of the servers really speak Japanese and don't try to correct me when I order a "sah-poro" instead of a "suh-poor-o) and they have the freshest, most high quality sushi in town BY FAR. I can't recommend any rolls off the menu since I usually just tell the chef what 100 0277I'm in the mood for. Last time I asked for some kind of roll that incorporated hamachi, salmon, jalepenos and lemon and it was THE BEST ROLL I'VE EVER HAD. EVER. "Came here for my birthday lunch while visiting my sister in Davis. The first thing I noticed when we went was how packed the place was when we arrived around 12pm (which is only an hour after they open). When looking at the menu, I was also really impressed at the wide selection of dishes, sushi, noodles, etc they had. Took my family quite awhile to select a sushi rolls since there were so many! (the waiter had to come back and forth 3 times before we were ready -_-) We selected the Nancy Roll, Rainbow Roll, and the Rock and Roll Roll. I'm not saying my place is bad in the slightest as I take advantage of my employee discount all the time, but Akebono is really good. I've had the mixed sashimi plate and it was really good but only slightly better quality than most sashimi in Sac. I usually come for the Croquette Curry and the Kaisen Shio Ramen. It's so good, I love croquettes and Japanese curry doesn't have as strong a flavor as Indian curries. I wish they had the option to make it spicier though, S&B ain't enough for me. The rice is far from dry, just how I love it. It's a tad pricey, but comes with so much! I hope it's not the box mixed curries like Hokkaido Ramen uses. 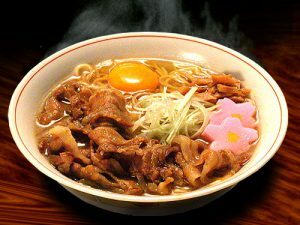 I hope they don't change the Kaisen Shio Ramen, it's so amazing! 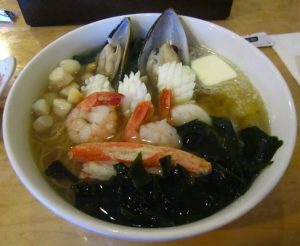 It comes with corn, spinach, seaweed, crab, scallops, shrimp, mussel, and squid and a lot of 'em! They cut a little square of butter to melt into the soup like they do in Japan too. Everyone who's eaten their ramen say it's the best and I concur. Service is nice and prompt, the waiter with long hair and glasses is always super nice. Kinda small space so sometimes gets croweded but I've only waited once and it wasn't long at all as the bar is usually empty. Sit at the bar people, it's the same thing if not better because if you need something the sushi chefs will usually tell the servers to help you. The hours aren't the greatest but still reasonable. Water is always refilled when running low.